To protect your assets from lawsuits, you do not want to personally own any assets. You need to separate your assets into “safe” assets and “unsafe” assets. A safe asset is an asset that will not trigger a lawsuit such as artwork, gold, stocks, jewelry, and savings accounts. All of your safe assets can be put into one uniquely-drafted Family Limited Partnership (FLP), and they will be one hundred percent protected. If a lawsuit is filed against you or your business, your safe assets are unreachable because they are in a separate legal entity. An unsafe asset is an asset that has liability. Unsafe assets are things like cars, real estate, boats, and airplanes. You never want to place unsafe assets in the same limited partnership with safe assets. If you owned three rental properties, you would want to consider having each property in a separate legal entity. If someone were to slip and fall at a property and sue you, your other properties and other assets would be unreachable because they were in separate legal entities. There are six states (Florida, Iowa, Kansas, Oklahoma, South Dakota, and Texas) that have a no-dollar cap on the homestead exemption. This means that your primary home in these six states, regardless of value, cannot be taken by a judgment creditor and is thus protected from lawsuits by state law. In the other 44 states you may want to put your home into a Family Limited Partnership or LLC to protect it against a lawsuit. If you do not want your personal assets and your financial interest in Family Limited Partnerships/LLCs to go through probate, you should set up a living trust. 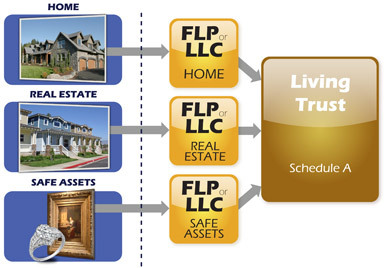 To fund the living trust, you specify on the Schedule A of your living trust your interest in each of the Family Limited Partnerships, and all of the assets in your Family Limited Partnerships/LLCs will avoid probate. Many people hold their business assets as a sole proprietor or in the name of a corporation or LLC. A sole proprietorship is the worst way to operate a business for taxes and liability. You need to have a corporation or an LLC, which is taxed as a corporation, to operate your business. A corporation is a good management and tax reduction tool, but it is a poor lawsuit protection tool, so your corporation should not own assets. If your corporation owns assets and your corporation is sued, all of the assets in your corporation can be taken to satisfy the judgment. To protect your business assets, you will want to have Family Limited Partnerships or LLCs own the business assets (real estate, equipment, etc.) and then have the Family Limited Partnerships or LLCs lease the assets to your corporation. A Charitable Remainder Trust (CRT) is a strategy that will work for some to avoid paying capital gains tax on the sale of appreciated assets (real estate, business, stock, etc.). You simply transfer the asset(s) into a CRT and then have the CRT sell the asset(s). Since the CRT is a charity, no capital gains tax is owed. You can receive income from the CRT each month for the rest of your life, but upon your death (if married upon the death of you and your spouse) the assets remaining in the CRT must go to a charity. If you wish to give the assets to your family upon your death, you can set up a Family Foundation (FF) and designate this family charity as the beneficiary of your CRT.